GT1 can complete coverage of ALL BMW systems. One thing that can only be done using the GT1, this function is called Electronic Control Unit (ECU) programming and configuration. Many of the original electronic systems on modern vehicles can now be re programmed using software; historically any changes to rectify software problems would involve a new ECU which would be purchased from the parts department and that is the only way that the independent market today is able to overcome these problems. The BMW GT1 system allows you re programme all BMW car ECU's to fix software or to install a blank ECU to a repaired vehicle. GT1 is the only system that allows you to do this and is absolutely essential if working on Freelander, the GT1 is also the only system that provides all diagnostics and programming for the very latest BMW launched this year. Test function; Read faulty code, clear faulty code, data stream, activate state, programming, component test, maintenance data information, components location, wiring diagram etc, TIS AND DIS ARE SUPPLY all of system diagram of all of BMW car, Components location, maintainence method and coding information etc. 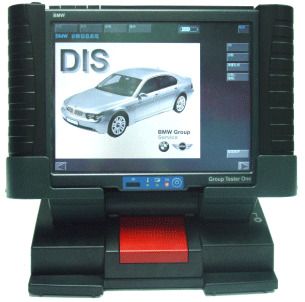 Can do completely of Bmw car system.